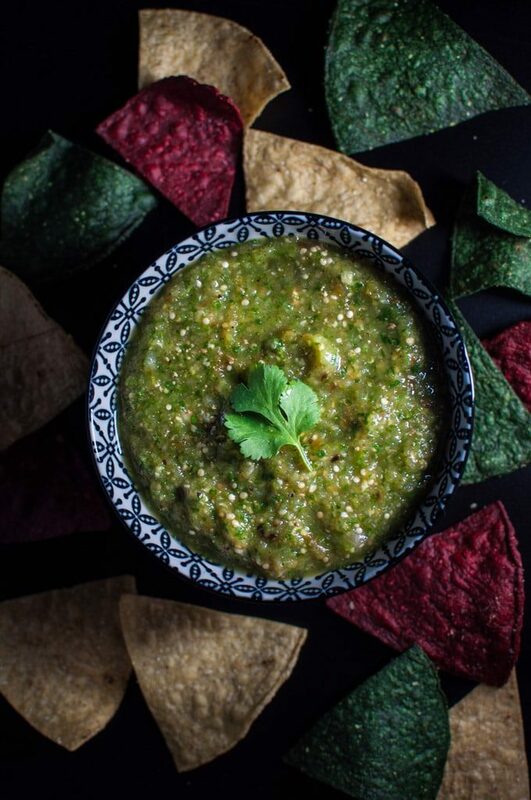 This roasted tomatillo salsa verde recipe is fresh, flavorful, and easy! The tastiest salsa verde you will ever make. This Mexican green salsa recipe is perfect for any occasion, including your selection of snacks for Super Bowl. 🙂 This salsa verde is definitely a healthy Super Bowl snack. Those tortilla chips… maybe not so much, though. Can you eat raw tomatillos? Yes, but they’re really sour when they’re not cooked. When I was a kid, we had a tomatillo bush, and I loved to pick them and then step on them. I was a horrible child. Spotting tomatillos in the grocery store gave me intense flashbacks. I thought I would make up for my sins and make a fantastic homemade salsa verde recipe to share with you all. I’ve made salsas before and love roasting vegetables, so I figured roasting tomatillos for the salsa is the logical way to get rid of the sour. I did a quick Google search to confirm I was on the right path, and lo and behold, I am not the only person in the world who thought of roasting tomatillos for their salsa verde. What. Roasted tomatillos are much more mellow and sweet than their raw counterparts. And they go wonderfully with the jalapenos in this spicy Mexican green sauce. Cut the tomatillos in half and roast at 375F for about 40 minutes or until they’re slightly charred. Meanwhile, add the onion, garlic, cilantro, lime, and jalapeno to the food processor. Let the tomatillos cool for 5 minutes, then add them to the food processor and process until smooth. Do you love salsa verde? Let me know in the comments below! Pre-heat oven to 375F. Place rack at the top of the oven. Place tomatillo halves on a non-stick baking sheet. Bake for 40 minutes or until soft and slightly blackened. Meanwhile, prepare and add all other ingredients to a food processor. Once tomatillos are cooked, take out of oven and let cool for five minutes. Once cooled, add tomatillos to food processor and blend on high until mixture is smooth. You may need to stop and scrape sides halfway through. This amount of salsa is good if you're serving a bunch of different appetizers/dips. You could easily double the recipe if you have lots of people to feed. Omit the jalapeno if you want a mild salsa. Tomatillo salsa is one of my favorites. How cool was it that you had a tomatillo bush as a kid, even though you totally didn’t appreciate it! 😉 I would love to have one of those bushes now in my back yard and make this salsa every day (cause those little suckers are expensive in the grocery store). Thanks Karrie!! Haha yes I would love to have one again. Oh well. Yum, I have never made tomatillo salsa but it looks delicious! I bet the roasting gives it such a nice flavor! Thanks Meghan ? you should try it. I was reading your About page, and I’ve never had lavender tea before, but it sounds like a really nice thing to have before bed- totally not weak! Hahaha. Thanks so much Amber!! Harney and Sons makes my favorite lavender tea ?